Cheese is an ancient food whose origins predate recorded history. There is no conclusive evidence indicating where cheesemaking originated, either in Europe, Central Asia or the Middle East, but the practice had spread within Europe prior to Roman times and, according to Pliny the Elder, had become a sophisticated enterprise by the time the Roman Empire came into being. Proposed dates for the origin of cheese range from around 8000 BCE (when goats and then sheep were first domesticated) to around 3000 BCE. The first cheese may have been made by people in the Middle East or by nomadic Turkic tribes in Central Asia. Since animal skins and inflated internal organs have, since ancient times, provided storage vessels for a range of foodstuffs, it is probable that the process of cheese making was discovered accidentally by storing milk in a container made from the stomach of an animal, resulting in the milk being turned to curd and whey by the rennet from the stomach. There is a legend with variations about the discovery of cheese by an Arab trader who used this method of storing milk. Cheesemaking may have begun independently of this by the pressing and salting of curdled milk in order to preserve it. Observation that the effect of making milk in an animal stomach gave more solid and better-textured curds, may have led to the deliberate addition of rennet. The earliest archeological evidence of cheesemaking has been found in Egyptian tomb murals, dating to about 2000 BCE. The earliest cheeses were likely to have been quite sour and salty, similar in texture to rustic cottage cheese or feta, a crumbly, flavorful Greek cheese. In Late Bronze Age Minoan-Mycenaean Crete, Linear B tablets record the inventorying of cheese (tu-ro), as well as flocks and shepherds. Cheese produced in Europe, where climates are cooler than in the Middle East, required less salt for preservation. With less salt and acidity, the cheese became a suitable environment for useful microbes and molds, giving aged cheeses their pronounced and interesting flavors. When he had so done he sat down and milked his ewes and goats, all in due course, and then let each of them have her own young. He curdled half the milk and set it aside in wicker strainers. A letter of Epicurus to his patron requests a wheel of hard cheese, so that he may make a feast whenever he wishes. Pliny recorded the tradition at Rome that Zoroaster had lived on cheese. By Roman times, cheese was an everyday food and cheesemaking a mature art. Columella's De Re Rustica (circa 65 CE) details a cheesemaking process involving rennet coagulation, pressing of the curd, salting, and aging. Pliny's Natural History (77 CE) devotes a chapter (XI, 97) to describing the diversity of cheeses enjoyed by Romans of the early Empire. He stated that the best cheeses came from the villages near Nîmes, but did not keep long and had to be eaten fresh. Cheeses of the Alps and Apennines were as remarkable for their variety then as now. A Ligurian cheese was noted for being made mostly from sheep's milk, and some cheeses produced nearby were stated to weigh as much as a thousand pounds each. 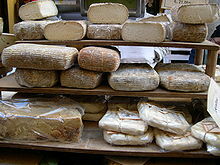 Goats' milk cheese was a recent taste in Rome, improved over the "medicinal taste" of Gaul's similar cheeses by smoking. Of cheeses from overseas, Pliny preferred those of Bithynia in Asia Minor. Rome spread a uniform set of cheesemaking techniques throughout much of Europe, and introduced cheesemaking to areas without a previous history of it. As Rome declined and long-distance trade collapsed, cheese in Europe diversified further, with various locales developing their own distinctive cheesemaking traditions and products. The British Cheese Board claims that Britain has approximately 700 distinct local cheeses; France and Italy have perhaps 400 each. (A French proverb holds there is a different French cheese for every day of the year, and Charles de Gaulle once asked "how can you govern a country in which there are 246 kinds of cheese?") Still, the advancement of the cheese art in Europe was slow during the centuries after Rome's fall. Many cheeses today were first recorded in the late Middle Ages or after— cheeses like Cheddar around 1500 CE, Parmesan in 1597, Gouda in 1697, and Camembert in 1791. In 1546, The Proverbs of John Heywood claimed "the moon is made of a greene cheese." (Greene may refer here not to the color, as many now think, but to being new or unaged.) Variations on this sentiment were long repeated and NASA exploited this myth for an April Fool's spoof announcement in 2006. Until its modern spread along with European culture, cheese was nearly unheard of in oriental cultures, in the pre-Columbian Americas, and only had limited use in sub-Mediterranean Africa, mainly being widespread and popular only in Europe and areas influenced strongly by its cultures. But with the spread, first of European imperialism, and later of Euro-American culture and food, cheese has gradually become known and increasingly popular worldwide, though still rarely considered a part of local ethnic cuisines outside Europe, the Middle East, and the Americas. The first factory for the industrial production of cheese opened in Switzerland in 1815, but it was in the United States where large-scale production first found real success. Credit usually goes to Jesse Williams, a dairy farmer from Rome, New York, who in 1851 started making cheese in an assembly-line fashion using the milk from neighboring farms. Within decades hundreds of such dairy associations existed. The 1860s saw the beginnings of mass-produced rennet, and by the turn of the century scientists were producing pure microbial cultures. Before then, bacteria in cheesemaking had come from the environment or from recycling an earlier batch's whey; the pure cultures meant a more standardized cheese could be produced. Factory-made cheese overtook traditional cheesemaking in the World War II era, and factories have been the source of most cheese in America and Europe ever since. Today, Americans buy more processed cheese than "real", factory-made or not.